There are many issues and it's very likely to encounter at least one. SilentPatch fixes many of these issues. A 1.0 exe is required for mods such as SkyGFX. 9.7 Game crashes randomly with "Unhandled exception"
SecuROM 4 DRM disc check. Polish versions sold in Classics collection from Cenega require Internet activation, but have no DRM. Steam version needs to be downgraded in order to be seriously modded. Some radio songs have been removed for new Steam buyers; Steam version purchases made before December 2012 still include these songs. Patch 1.1 is the latest patch available. Most digital distribution versions already include this patch. Fixes numerous bugs and oversights introduced in the PC version. Stretched HUD and misaligned aiming. See Widescreen resolution. Everything but 30 FPS introduces physical and technical issues. 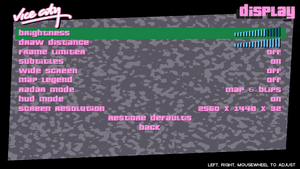 In-game wide screen option allows to retain proper aspect ratio, though only for 16:9 resolutions. Otherwise picture is stretched. Yet not only wide screen option cuts part of the image (Vert-), it does also misalign aiming. MSAA can be enabled for non-Steam versions. See Anti-aliasing (AA). For Xbox and DualShock prompts use GInput. 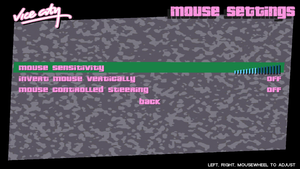 Download the y-axis mouse sensitivity fix. Extract the contents of archive to a continent location. Open vcsens.txt and follow the provided instructions. Fan translation, The Project itself and download and GitHub. Retail only. Patch for digital release here. Unofficial audio translation is avaliable. Two different fan localizations, #1 and #2. An unlocked or incorrect frame rate cap can result in timing issues. It is noticeable upon starting a new game, when a black screen appears with the writing "Marco's Bistro, Liberty City, 1986". Pedestrians seem to be "running" and cars move on and off screen extremely fast. Certain models such as bridges or stairs take a few seconds to "pop in" even if the character is standing near to or next to the model. In the mission "The Driver", a character may fall through the a bridge. Vice City with almost no cars or pedestrians on the streets and seems a ghost-town. Game is limited to 30FPS. The game starts, however it crashes directly after the intro move with the error "gta-vc.exe has encountered a problem and needs to close." Game crashes randomly with "Unhandled exception"
In the Properties of gta-vc.exe change Compatibility mode to Windows 98/Me. Set the Privilege Level to Run this program as an administrator. In the Steam command line options, add -CPUCount:1. Rename or move the original gta-vc.exe. Launch the game through Steam. The client will use the new gta-vc.exe as entry point. If this does not work, maybe Rockstar's support article does. The camera locks in slow-motion and does not release the view. Alt + Tab out of the game. Click on Vice City on your task bar. Alt + Tab back in. Playing wide screen places the real aim slightly above and to the right of the displayed crosshairs. AI Enhanced Textures for Vice City - Replaces all textures with 4x AI Enhanced versions of the originals. 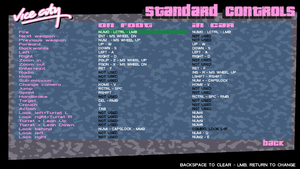 GTA Vice City - Updated SCM - Fixes/Restores/Improves mission-specific stuff. GTA:FPS - Play the game in first person. Vice Cry 1.8 - Major graphics overhaul for the game. Spaceeinstein's All In One Mod v3.2 - Adds new features, new optional mods, fixes the gameplay and restores some beta features. 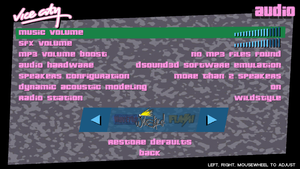 Vice City - The Leftovers Fix - This reinstates missing or changed artifacts from the PlayStation 2 version of the game. ↑ 1.0 1.1 File/folder structure within this directory reflects the path(s) listed for Windows and/or Steam game data (use Wine regedit to access Windows registry paths). Games with Steam Cloud support may store data in ~/.steam/steam/userdata/<user-id>/12110/ in addition to or instead of this directory. The app ID (12110) may differ in some cases. Treat backslashes as forward slashes. See the glossary page for details. 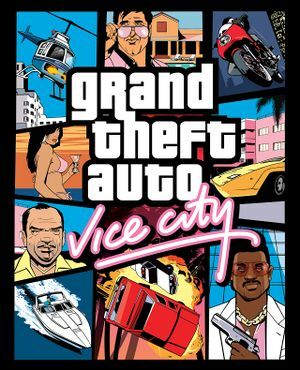 ↑ 1.0 1.1 1.2 1.3 1.4 "Vice City on Windows Vista & Windows 7"
↑ "Bug List with Solutions (PC, PS2 & Xbox)"